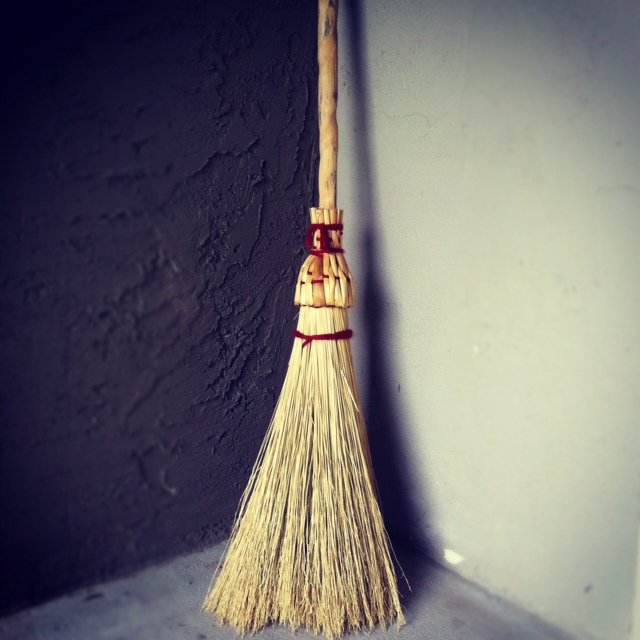 *Note: The 1800's style brooms by Davis Mountain Broom Company are available for sale exclusively at No. 4 St. James . If you are interested in purchasing one of these outstanding handmade products from this authentic West Texas workshop, please visit www.fourstjames.com. Ron Cox is humble about his brooms. “It’s a pretty good broom, too. Here: try it,” he told me, as if its functionality was an afterthought. I dropped the brush to what appeared to be a very clean spot on the floor, then made the standard sweeping motion. Just a single stroke, more like a putt, really. And from nowhere: a puff of dust, like the one that follows Pigpen in It's The Great Pumpkin, Charlie Brown. Yeah, it’s a pretty good broom. The one I brought home to Austin is the Round Kitchen Broom. The brush on this model, made of 100% natural broom corn, is quite wide, so you’ll need an extra large dust pan. Smaller models, including whisks, also are available. I got mine in person, at Ron Cox’s modest roadside workshop, the Davis Mt. Broom Shop. And that’s where I recommend you get yours. You’ll have to drive to Fort Davis to do so, which means you’ll have to take a road trip to West Texas, which means you’ll have to see where God Himself escapes to when He wants to feel more free, when He wants to feel just a little bit small. And you’ll feel that way, too. So, go to West Texas. Go and see an authentic craftsman at work. Ron Cox is 76 years old, and he (by himself) hand-makes thousands of brooms each year on an 1800’s era, Shaker-built loom using yucca and cactus wood that he harvests himself from the ranches scattered across the Davis Mountains. That’s right: thousands of brooms, by himself. “I have no intention of slowing down,” Cox told me. Visit the Davis Mt. Broom Shop: Here. Feature descriptions Copyright © 2016, The Diego Files, All rights reserved.